WASHINGTON (CNS) — Although some details have emerged of the conversation between Pope Francis and President Barack Obama March 27, the public may never know all that was said in that 50-minute get-together behind closed doors at the Vatican. And that’s pretty much the story for most of the meetings between 12 U.S. presidents and six popes in the course of the past 90 years. In recent decades these meetings — complete with requisite gift exchanges, pleasantries, photo opportunities and private discussions — have been fairly standard for the two heads of state. But the tradition is hardly an ancient one. The first such meeting occurred when President Woodrow Wilson met Pope Benedict XV at the Vatican Jan. 4, 1919, less than two months after the end of World War I. “That must’ve been interesting,” said Msgr. Robert Wister, professor of church history at Immaculate Conception Seminary School of Theology at Seton Hall University in South Orange, N.J. The priest said Wilson and the pope shared a common view of ending the war and promoting peace. Wilson’s famous 14-point peace plan, which he presented to Congress in January 1918, echoed many of the ideas expressed in Pope Benedict’s peace proposal of August 1917. The other significant aspect of this meeting, said Msgr. Wister, is that Wilson visited the pope during the years when popes were described as prisoners of the Vatican — in the words of Pope Pius IX — because they did not travel during the years of 1871-1929, when the Italian Unification Movement was in power before Vatican City was established. After Wilson met the pope there was a 40-year-hiatus — when five other presidents were in office — before another papal-presidential meeting took place. Maureen Tilley, professor of theology and medieval studies at New York’s Fordham University, attributes the lack of diplomatic visits at that time to a resurgence of anti-Catholicism in the U.S. in the late 1920s and early 1930s. She also said it would have been impossible for such a visit during the years of World War II. Then Blessed John XXIII became the church leader in 1958. Tilley said he was the first pope “to set foot outside of the Vatican territory, and for that he was nicknamed Johnny Walker.” She also noted that in his “very broad-minded and open-to-the-world ideas he met with Dwight Eisenhower,” and from then on a tradition was set. The only pope from that point on who did not meet with a U.S. president was Pope John Paul I — in office only 33 days in 1978 before his death. President John Kennedy met Pope Paul VI at the Vatican, July 2, 1963, just weeks after the pope was elected and four months before Kennedy’s assassination. Pope Paul, the first pope to visit the United States, met President Lyndon Johnson in New York in 1965. During that visit, the pope addressed the United Nations and stressed his objections to the Vietnam War. The first pope-president meeting at the White House was when Blessed John Paul II visited President Jimmy Carter at the White House Oct. 6, 1979. But that visit hardly started a trend because the next White House stop for a pope was not until 2008, when Pope Benedict XVI visited President George W. Bush there. President Ronald Reagan met with Blessed John Paul II four times — twice at the Vatican, once in Fairbanks, Alaska, where the two heads of state made a stop during travel, and once in Miami, where the pope was visiting. Msgr. Wister said the pope’s visits with Reagan have particular significance. The first, in 1982 at the Vatican, was one year after both men had been shot in assassination attempts. 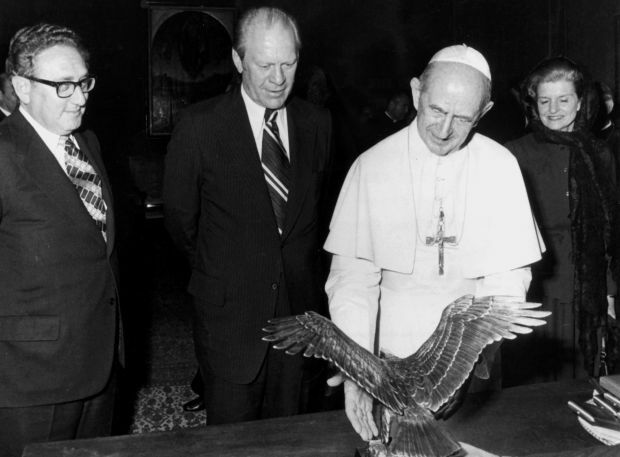 The second meeting, in Fairbanks, May 2, 1984, took place just four months after the United States formally recognized the Holy See. Before this, the United States had personal representatives, not ambassadors, at the Vatican. “Looking at the long view, it’s interesting how scared the United States was of diplomatic relations” with the Vatican, Novak added. He said Reagan’s decision seemed an obvious one since the Vatican had been a big player behind the scenes in diplomacy. Novak pointed out that the brief meetings with U.S. president and popes are not where the diplomatic work gets done, which happens at the ambassador levels, but he said the encounters can set the stage for further action. For example, the first meeting of Reagan and Blessed John Paul “ended up being an important personal collaboration” as the two leaders “assessed one another” about their shared resistance to the Soviet bloc in Eastern Europe. He mentioned Reagan and Blessed John Paul’s shared resolve to liberate Poland and other countries from communist rule. He also said Blessed John Paul’s “unambiguous disapproval of the war in Iraq” was made clear when Bush met the pope at the Vatican in 2004 and presented him with the Presidential Medal of Freedom. This visit also makes one historical footnote. Obama and Bush are the only presidents to meet two popes while in office. Bush met with both Blessed John Paul and Pope Benedict. Obama met Pope Benedict at the Vatican in 2009.